WELCOME TO LONDON, 1899 It has been six years since the discovery of intelligent life on Mars, and relations between the two worlds are rapidly developing. Three-legged Martian omnibuses stride through the streets and across the landscape, while Queen Victoria has been returned to the vigour of youth by Martian rejuvenation drugs. Victorian computer technology is proceeding apace, thanks to the faeries who power the 'cogitators' while the first aether zeppelins are nearing completion, with a British expedition to the Moon being planned for the following year. Everything seems to be going swimmingly until Lunan R'ondd, Martian Ambassador to the Court of Saint James's, dies while attending a banquet at Buckingham Palace. The discovery of strange, microscopic larvae in his breathing apparatus leads Queen Victoria to suspect that he may have been the victim of a bizarre assassination. The Martian Parliament agrees, and they are not pleased. No Martian has ever died in such suspicious circumstances while on Earth. An ultimatum is given: if Her Majesty's Government cannot solve the crime and bring the perpetrator to justice, the Martians will! Enter Thomas Blackwood, Special Investigator for Her Majesty's Bureau of Clandestine Affairs. 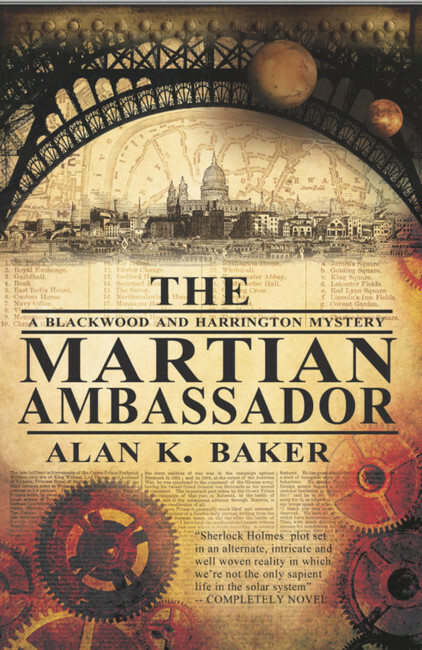 Along with Lady Sophia Harrington, Secretary of the Society for Psychical Research, Blackwood is charged with the task of solving the mystery of Ambassador R'ondd's death, before the Martians take matters into their own hands, possibly igniting an interplanetary war in the process!